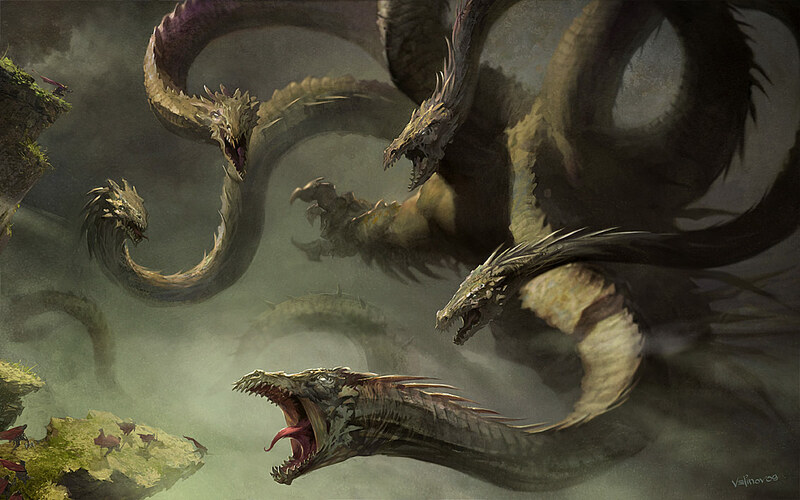 The first three essays in this Hydra-Headed Meta-Delusion series explain massive delusions that affect the entire world and more particularly the USA. The first massive delusion is exposed as the world’s belief that through the Paris Accord it has addressed the most pressing and pervasive crisis humanity has yet faced, i.e., rapid and disastrous climate heating and runaway climate destabilization. The demonstration of the Tinkerbell-Effect points to the delusions that those who supposedly are working to stabilize climate suffer from. That group is not the political group administering the US political system that many are supposedly “resisting,” but the vast majority of the world who believe that we are moving toward climate stabilization. Evidence shows however that technological developments and current efforts to reduce or mitigate greenhouse gas pollutants are trivial compared to the dramatic and immediate reductions in fossil fuels required. Then focusing more specifically on the US, the second essay explores the delusions the US uses to continue with the economic, political, social and moral (ESPMs) systems that are exhausting the ecological bases of life and the destruction of our life support systems. Through simple and straightforward analysis the third essay explains how the US – with its unrelenting cycle of extraction, consumption and pollution – takes from Mother Earth’s bounty more than 200% of what she can regenerate or sustain each year. Despite the overwhelming evidence and information that is indisputable, the Association for the Tree of Life understands that facts alone will not move or change dominant human behavioral patterns or habituated cultural perspectives. The stories we tell ourselves, the cultural paradigms that represent the water we fish swim in, change slowly until they no longer work. It is easy then to ignore coming disasters, even though we may acknowledge their looming reality. Most people continue to use vast amounts of fossil fuels, fly for pleasure or work, and consume far more than our happiness warrants, even though we are aware our excesses will have dark consequences sometime down the road. The future is “discounted” by all of us, not only by economists. It is proof that evolutionary survival continues to work. In essence, it is simple. First, the current stories we tell ourselves, the narratives we use to navigate the world will continue until they are “exploded” and replaced by different stories with different narratives. The bankrupt stories and lethal narratives that compose current Reality Paradigms must be seen and viscerally felt to be wrong, and clearly so. Without a felt sense of revulsion, shame, and horror related to the economic, social, political and moral systems that are our current stories, they will continue. And we must both see and feel the fallacies of the stories and the non-sense nature of the narratives. So, the third essay introduced what humanity has done in the last single human lifetime with plastic to cause the “see and feel” reaction. With pictures and videos that related the shame, disgust, horror. This essay builds on that prior one. Explosion of the current stories and narratives, at a minimum will set the conditions for new stories and reality-based narratives. It is absolutely necessary that the current operating systems of our US society, the extraction, production, consumption, waste roller-coaster, that we believe we can continue must be exploded then discarded so that new pathways and new systems can be constructed. Get a discussion of this graphic here. The graphic above is drawn from the work of Vaclav Smil. A part of his “Earth’s Biosphere,” which could be subtitled, “Humanity Consuming the Biosphere,” is linked here. It is important to absorb this information slowly because the totals are incredible. First, humans were a tiny part of total mammals until the Industrial Age. Then, sometime in the 19th century, the total mass of humanity reached the total mass of wild mammals. By the beginning of the 20th century, the total weight of humanity was more than 200% of that of wild animals. Human livestock and pets add more tonnage to the one-sided scale. At about 1900, livestock and pets represented about 3 times the total mass of wild mammals. By 2000, the total had swelled to 25 times the wild weight. 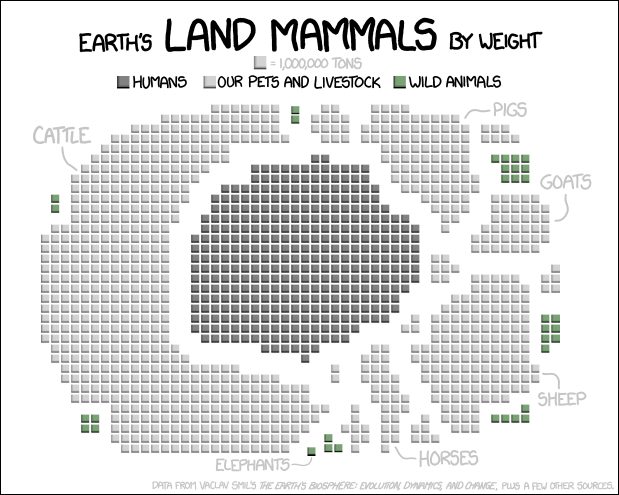 Now, humans and our domesticates are more than 98% of the mammal weight on our Earth, while wild mammals comprise less than 2% of the total. This profound shift, from a wild mammal world to a human + domesticated one has occurred just during the industrial age. Consuming the wild mammals indeed! If humans do not see this animal genocide as a horrible crime, what would all of the rest of the non-human mammals call it? Here, the purpose of these gruesome graphics and their explanations is: (1) to point out how ecocidal humans have been, and (2) to rip-apart the delusion, when it comes to those we share the planet with, that we can continue to do what we have been doing for even another few years, much less for the next generation or two. Thus, helping to shatter the current story, narrative, and world-view. Dear Reader, if you are able to grasp the gravity of the delusion represented in this section above, and if you can tolerate considerably more detail, you might consult the Living Planet Report: Executive Summary or complete publication. Or, you might review the Living Blue Planet Report. The obvious conclusion that these ideas and images needs must produce is that we cannot continue to do what we are now doing, either economically, politically, socially or (perhaps most importantly) morally. The second half of the 20th Century is unique in the history of human existence. Many human activities reached take-off points sometime in the 20th Century and sharply accelerated towards the end of the century. The last 60 years have without doubt seen the most profound transformation of the human relationship with the natural world in the history of humankind. The effects of the accelerating human changes are now clearly discernible at the Earth system level. Many key indicators of the functioning of the Earth system are now showing responses that are, at least in part, driven by the changing human imprint on the planet. The human imprint influences all components of the global environment - oceans, coastal zone, atmosphere, and land. Spend a minute or two with the Great Acceleration PowerPoint that displays the human-driven impacts related to our Earth, her resources, living systems, life-support systems, and more. These astoundingly burgeoning impacts predict collapse. We just don’t know exactly when. But, the trends and the graphic pictures of them are designed here to cause the Reader-Viewer both to see clearly and to viscerally feel how disastrous are our current extraction-production-consumption-waste habits. The assembly-line ravenous and relentless overuse and overshoot must be halted and our Earth-overuse put back into balance with Earth-regeneration. Anything resembling the current pathways and habits, our present treatment of our Earth and what we extract from her will mean consummate catastrophe, and soon. The same patterns of overuse and looming exhaustion could be shown in many ways; the repetition would overwhelm. Instead, just one more summary graphic will suffice, to illustrate the clarity of overuse along with the impossibility of continuing to do what we are currently doing economically, socially, politically and morally. The above pictograph summarizes several accelerations that show how the industrial world as it now operates is over-stuffing the world with production and waste, and corresponding scale. The National Geographic, March 2011 published this summary. What it shows is that that humanity, our life support systems, and much of life itself will drown in over-production, over-development, and overshoot. Note that this was a 2011 picture and the big-box has since expanded significantly. The purpose of these illustrations, in this essay and the prior one is to induce a “felt-sense” of disgust, horror and revulsion, related to our actions and activities that are causing the current and impending disasters that face us. The intent is to “show” the tragedies being enacted, at the world scale and the national scale, and to induce feelings of rejection so that current operating systems can be discarded and so that healthy patterns with operating systems that allow a viable future can be instituted. Importantly, the rejection of maladaptive operating systems and the construction of healthy ones are separate processes. That is, the current stories we tell ourselves, the cultural mythologies, the narratives of our lives, the world-views that support all of these, must be destroyed and discarded. It may well be easy to argue that we cannot function in our world without workable narratives, stories we tell ourselves, sensible worldviews, and the like. But, and this is critical, the current operating systems, to encompass all of these in a sentence, are comprehensively destructive. Not only must this be obvious, but it must be strongly felt so that new stories, worldviews, and narratives can replace them. Thus, we need to replace destructive operating systems, beliefs, and narratives with sensible, viable and durable ones. Consider the two policy streams represented by US political parties and how neither can consistently motivate their own constituencies. Consider the economic operating system that over-enriches the few while leaving out many millions. Consider our current contentious social systems that promote patently false narratives and promote blame and division. Consider the current moral systems that promote extreme wealth for the few while billions are systematically deprived of worth and dignity. And, these examples apply only to the human dimension of the crises. Humanity is making a mess of our home, extracting and consuming too much, fouling our one-and-only nest, and killing the future. Besides, we are on-track to take much of the rest of life with us down the chute of oblivion. The purpose of this essay and the first three that precede it is to elicit a deep rejection response on the part of humanity, particularly in the wealthier industrial world. Humanity’s current operating systems, that is, the destructive pathways we are tracking must be attacked and exploded. At this point, the delusions that support the current insupportable ways and means in everyday life in our over-developed world should be both apparent and palpable. The next and final section of this series is devoted to showing how life-affirming narratives and operating systems can be established. Therefore, the visual and visceral realizations of our comprehensive destruction of our lives and life-supports, once apprehended need to be held only long enough for the disaster plan that follows. Certainly, we theoretically can constrain our destructive systems, certainly we have the ability to return to ways of life that the planet can enduringly produce. The important question is how to take this “theoretical” possibility and turn it into reality. 1� Constructive responses to our collective overshoot are necessary, as a prudent reader cannot respond individually because the scale, scope and urgency of the crises are too overwhelming. So, after the conclusion of this series, a reader could return to these links wherein William Catton further details the current Bottleneck. One is Catton’s short paper titled “Sociology’s Neglect of Ecological Context,” and the other is Catton’s video interview from What a Way to Go, Life at the End of Empire.